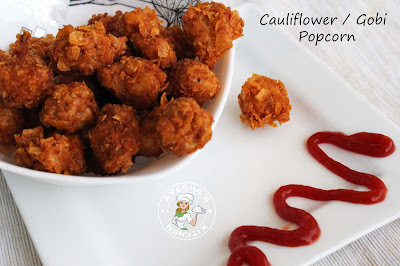 How about a veg popcorn recipe with every ones favorite vegetable cauliflower / gobi? 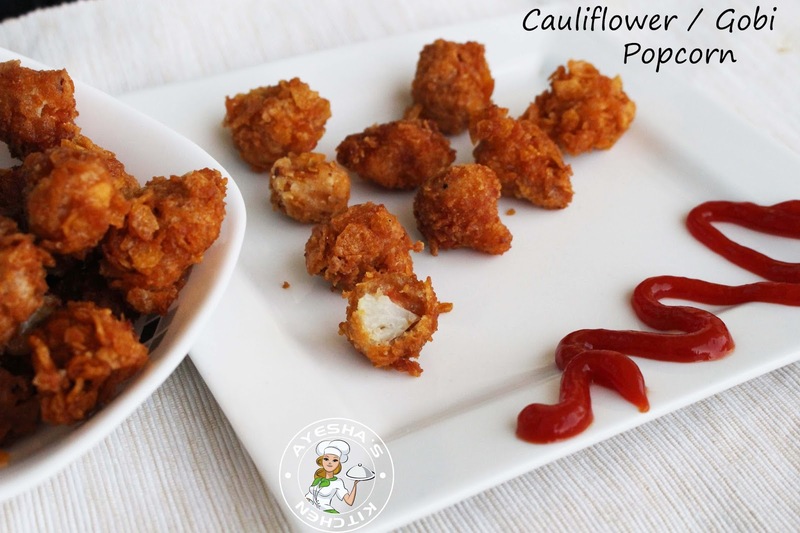 Popcorn chicken is a very popular kids snack / snack for kids. Veggies...here is your very delicious snack recipe or popcorn recipe with gobi. This veg snacks recipe is very yummy with crispy crunchy crust and soft inside. This is a must try veggie starter recipe that turns out really well. Hope you all will love this recipe. So here is the recipe showing how to make pop corn recipe with gobi / cauliflower recipes for snack / kids healthy snack / healthy snack ideas for kids. Cornflakes - 1 cup or more, crush it with hand. Clean the cauliflower well and thinly slice the florets into bite sized pieces and then marinate it with garlic paste, tomato sauce, soy sauce, chili powder (optional) and salt. Keep refrigerated for 15 minutes.. In a bowl , add cornflour . Keep it aside. Beat an egg with pepper powder. Add salt and Keep it aside in a separate bowl. In another bowl , add crushed corn flakes for final coating. Keep it aside. Now take the marinated sliced gobi or cauliflower florets out and first dip each thin pieces in cornflour mixture , then in egg batter and finally roll in crushed cornflakes. Gently shape it like a small ball with your hands. Do it one by one and place it in a plate. Only this process is time consuming. (NEVER mix the all marinated cauliflower with cornflour and coat all together. ALWAYS Coat one by one.). When it turns golden ,remove it to a serving plate.